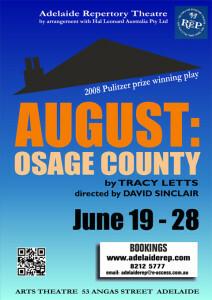 The Pulitzer Prize–winning play 'August: Osage County' comes to The Adelaide Repertory Theatre stage this June. Running for a strictly limited season, from June 19 to 28 2014, this critically acclaimed production will be directed by David Sinclair. Written by the multi award-winning American playwright Tracy Letts, 'August: Osage County' is the darkly comedic tale of the Weston clan, who are reunited in the wake of Beverly Weston's disappearance. Beverly, an alcoholic poet and the patriarch of the family, is married to Violet Weston, who is currently undergoing treatment for oral cancer. Her three daughters soon descend on the family home, seemingly to support their mother, but their gestures of goodwill spiral out of control, as their own secrets are slowly divulged. Set on the plains of modern day, middle-class Oklahoma, this enduring tale of family dysfunction has been a hit with audiences since it premiered at the Steppenwolf Theatre in Chicago in 2007. It has since been performed on Broadway at the Imperial Theater and at London's National Theatre. Tickets are priced $22 for adults and $17 for concession card holders. Please note that this production contains strong language, smoking and drug references. Tickets are now on sale through Trybooking: click here to proceed with a reservation.